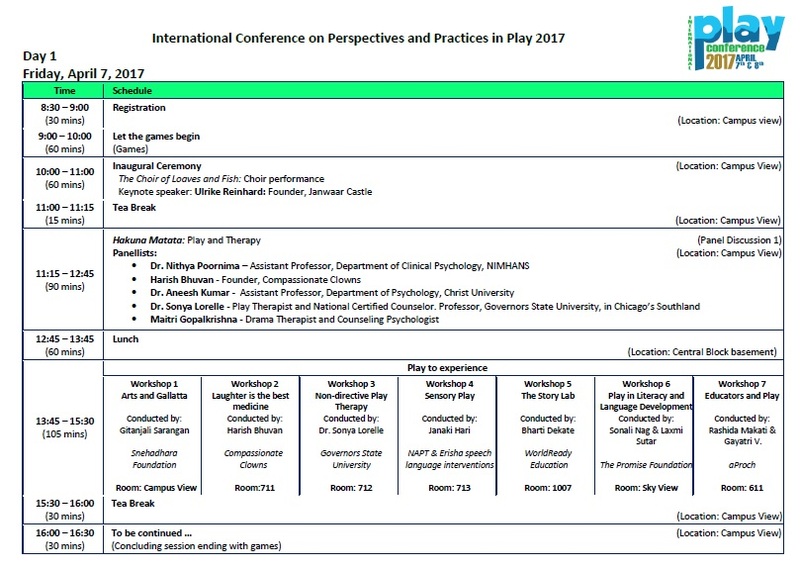 The conference brings together people, perspectives and practices from around the world on play, with a focus on the Indian experience. Traditional societies have a rich heritage of games and diverse cultural practices that provide opportunities for its members to develop their intrinsic interests and competencies, learn social skills and behaviours, regulate and express their emotions, socialise and experience joy. In addition, several innovative play initiatives have emerged in the area of child and youth development work, especially in the context of living with poverty, marginalisation, conflicts and other adverse conditions. Several other play-based initiatives seek to enhance learning outcomes, social domain goals or bring about change using play and creative mediums. While some of these people, perspectives and practices are well-known and celebrated, a vast majority of them are not known. 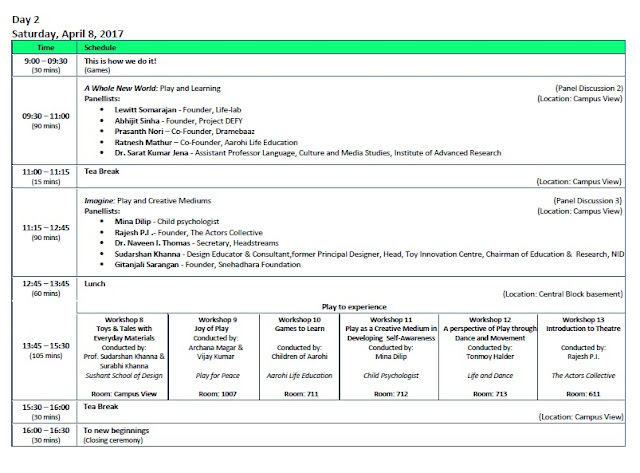 The objective of the conference is to bring together these voices, to celebrate them, to learn from them and to begin the path towards assimilating them to further the knowledge on how play facilitates fuller lives, mediates active learning and better change outcomes. 09.00-09.30 This is how we do it! The Choir of the Loaves and Fish is a team of spirited senior citizens aged 65-95 from the Holy Spirit Home on Bannerghatta Road. This initiative is the brainchild of Pervin Varma, former CEO of Child Rights and You (CRY), along with Regina Thomas, who started CRY in Bengaluru. The choir’s name was inspired by the story of Jesus feeding five thousand people with just five loaves and two fish offered by a young boy! Similarly the members bring their gifts and trust that they will be a blessing to the community. The idea is to bring meaning and hope into their lives through the process of making music and singing together! The choir performs two concerts a year on Independence Day and Christmas. This is their 11th performance in 5 years! “There are some people whose lives followed the logic of dynamic networks long before the internet appeared. In my time I’ve met a handful of characters who were digital natives in a much more radical sense than their date of birth might lead you to think. Ulrike Reinhard is one of them. She has the genius to be able to think and act in terms of interaction. In conversation with her, it’s easy to forget about set agendas and fixed outcomes and follow wherever the dynamics of open processes might lead. Dr. Shubhada Maitra is Professor with the Centre for Health and Mental Health, School of Social Work, Tata Institute of Social Sciences, Mumbai. At TISS she is engaged in teaching, research and field action. She teaches courses on mental health, counselling and therapy, qualitative research and child and adolescent mental health. Her areas of research include issues of mental health, sexual violence, gender-based violence and sexual and reproductive health. She is the Project Director of two field action projects at TISS: Tarasha, a community-based recovery project for women living with mental disorders and Muskaan, child and adolescent guidance centre of TISS. She has published nationally and internationally in peer-reviewed journals and has written two books, one on HIV/AIDS at the beginning of the HIV epidemic in India in 1992 and the other on Play and experiential methodologies of working with children in developmental and therapeutic settings. Harish Bhuvan is a trainer, facilitator and medical clown. He left his job at IIT Bombay to follow his passion of contributing towards the well being of children. Since then he has been attached with esteemed hospitals and hospices of India working with terminally ill children and their caregivers. His unique mélange of clowning elements and counseling techniques to release the disease induced trauma in children has been admired in media and public alike. He founded an organization Compassionate Clowns which is doing remarkable task of spreading love and laughter in the life of vulnerable children. Dr. Sonya Lorelle is a registered Play Therapist and National Certified Counsellor. She bridges theory with practice. She is a Professor at the Governors State University, in Chicago’s Southland. But she is also a practitioner who travels overseas. Her counselling interventions have taken her overseas- Bhutan and Thailand. Her areas of expertise include Play therapy, effects of trauma on children, child development, and qualitative methodology. She has conducted assessments, intakes, crisis intervention, parenting consultations and individual counseling sessions with children staying in homeless shelter. She provided monthly trainings to children’s services staff on various topics such as ages and stages, positive discipline, promoting healthy development and effects of trauma on children. She also works with college students. Since 2011, she has volunteered in Bhutan. She has demonstrated ability to work with children on a variety of issues, including depression, anxiety, divorce, trauma and domestic violence. During her interventions in Bhutan, she worked in schools and at the psychiatric hospital consulting, training, and providing direct services. She also provided a week-long workshop on Mental Health Facilitation to helpers and professionals in the country. Recently, she was in Thailand for three weeks where she gave training on play therapy. Maitri Gopalakrishna has a masters degree in Counselling Psychology with a concentration in Drama Therapy from the California Institute from Integral Studies, San Francisco. She is currently working on PhD from the Tata Institute of Social Sciences, Mumbai where she is doing practice­-research with Child Sexual Abuse Survivors within a Feminist theoretical and methodological lens. As part of this work, she collaboratively created a theatre performance called Positively Shameless that has been performed nine times in three cities. Maitri also practices as a counselling psychologist and drama therapist who works with individuals and groups at Parivarthan Counselling Training and Research Centre and is faculty on the Foundation Course in Expressive and Creative Arts Therapies (FECAT) run by the Studio for Movement Arts and Therapies, Bangalore. She lives and works in Bangalore. Drama Therapy is an umbrella term that encompasses several different methodologies and pracitisoners. Maitri today considers herself an intersectional Feminist therapist. In addition, “play” holds a central position in her practice as well as a conceptualisation of people as role takers and players that have the power to powerfully shape and re-shape their own narratives. Dr. Nithya is a trained Clinical Psychologist, having experience working with children and adolescents. She is currently employed as Assistant professor with the Department of Clinical Psychology, NIMHANS, Bengaluru, India. Parenting, fostering emotional well-being and resilience, early childhood enrichment, play and creative expressive methods of intervention, yoga and mindfulness are some of my current areas of interest. Training of mental health professionals and self-care among mental health professionals are other areas of interest. 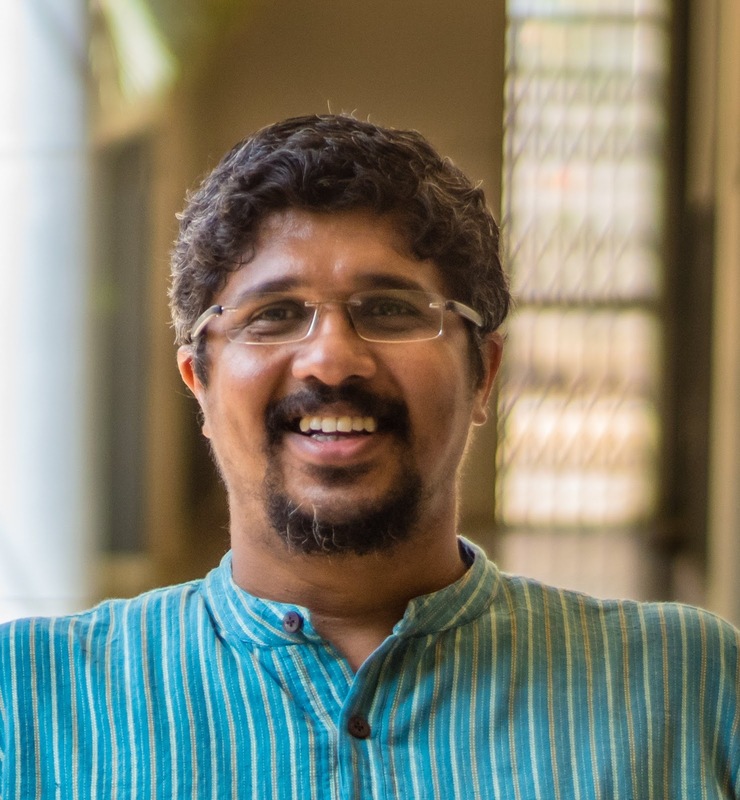 Aneesh Kumar P, PhD, is an Assistant Professor at the Department of Psychology, Christ University, Bengaluru. He has worked as project officer for Indian Council for Social Sciences Research (ICSSR) in Pondicherry University and as Head, Department of Psychology, Wadi Huda Institute of Research and Advanced Studies affiliated to Kannur University, Kerala. He has published and presented papers in various national and international forums in the area of public health, child and adolescent psychology. 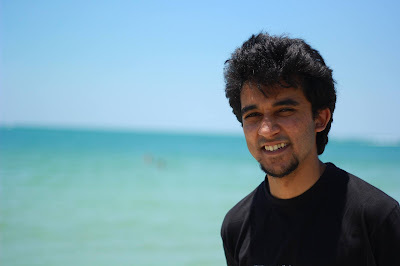 Currently he is also involved in various research project including developing a training model for culturally competent and evidence-based mental health care for diverse societies (United States-India Education Foundation), developing character strength among primary school students through classroom teaching, and socialization of emotion and construal of anxiety and depression among mothers (a multi country project). His research interest include development psychology, child mental health,and school counselling programs.He teaches papers in child and adolescent counselling, counselling interventions for special population, development psychology and qualitative research methods. Dr. Rajani Konantambigi is a Professor at the Centre for Human Ecology, School of Human Ecology, Tata Institute of Social Sciences, Mumbai, India. Her areas of teaching, research and outreach have been broadly in child development and socialization and research methodology. Major areas of research have been role of fathers in creating learning environments for children, ethnographic methods in researching child care settings in India, socialization of emotions, emotion regulation, child care and socialization in varied settings, play in children, Child Friendly Spaces, Mumbai, India: A collaborative project, with the Children’s Environment Research Group, New York, and TISS, issues in teaching-learning, learning disability, school based counselling and guidance, mental health issues surrounding children and meaning making of mental illness by caregivers of persons with mental illness. 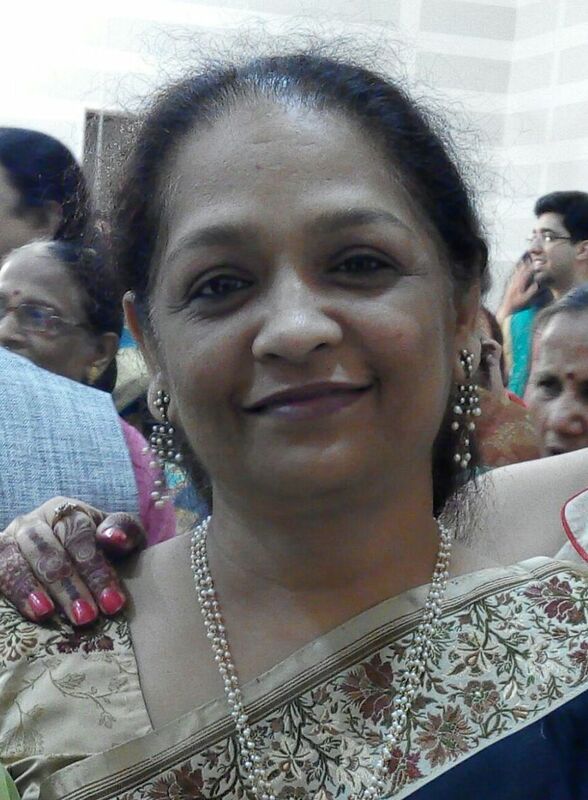 She has served as a member of board of studies in Human Development/Home Science, at the Universities of SNDT, Mumbai and MS University, Vadodara and as a consultant to primary and early childhood education for some trusts/organisations. She is an office bearer, President and Secretary of International Play Association, India and Association for Early Childhood Education and Development (AECED) respectively. 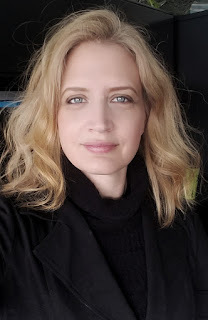 She also has a US Govt.’s Fulbright Postdoctoral Fellowship (completed from Georgia State University, Atlanta, 2001-02) and the Rockefeller’s Team Residency Fellowship to edit a book (at the Bellagio Study Center, Italy) in 2000. Lewitt is a social enterprise that is making science education fun & engaging for children in government schools. Life-Lab promotes Activity & Inquiry based learning by building the capacities of teachers. In 4 Years, Life-Lab has worked with more than 200 schools across 9 states, impacting close to 80,000 children. Lewitt is a Teach For India fellow, Acumen Fellow & Ashoka Fellow. 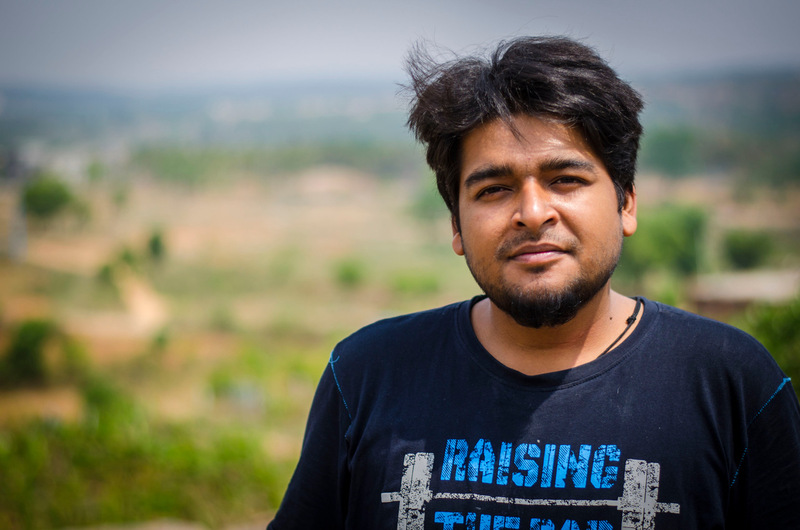 Prasanth is a Teach for India Fellow, is the Co Founder of Dramebaaz. Dramebaaz is an initiative to build creativity and confidence in children through the use of Drama. It also seeks to empower these students to be agents of social change. Dramebaaz works with children with our unique 4-stage process that covers writing skills, reading and analysis, skill-specific activities, effective rehearsals and a showcase to present their learnings. Abhijit is a young social innovator, and the founder of Project DEFY. He has designed many social innovations in India and Africa, including Bodacart – a $500 Ambulance for Africa, a waterless urinal, an accident detection app etc. He believes that high quality education should be accessible to all, and that each person should be capable enough to customise it, to their needs and interests. And all that needs to be broken is the fear of making choices. Hence, he created a first low-cost self-learning model where the learners create and run their schools and develop skills that interest them. Ratnesh Mathur works with children. 18 years into this and he is still learning about children. He likes learning with children. He does not like teaching. Ratnesh’s chief role is to agitate, to confuse, to challenge. For this reason children and parents consider him to be a mentor, but they call him tormentor. He has worked with all ages of children – from two years to teenagers. He has also worked intensely with parents and teachers. Ratnesh propagates democratic, learner driven environments. He is a part of Aarohi​ open learning community. Aarohi​ ​is a community of self directed learners -​ Children who decide what they want to learn, how they want to learn, when they want to learn and use self assessment. They do not follow any philosophy, they follow the child​. Aarohi offer​s​ an open learning environment at ​ its campus in a village near Hosur. Sarat Kumar Jena is an Assistant Professor of Language, Culture and Media Studies at Institute of Advanced Research, Gandhinagar (Gujarat). 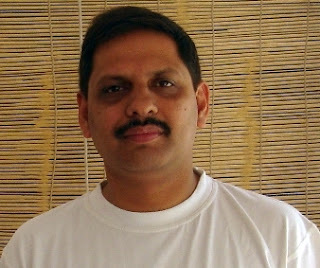 He is a senior researcher of comparative literature at Central University of Gujarat, Gandhinagar. He has about nine years of research experience in Indian literature in areas ‘Authenticity and ‘Misrepresentation’ in ‘Tribal Narratives’. An alumnus of Euro Science Open Forum 2016, Manchester (UK) and a recipient of Alfred Krupp Short Term Fellowship 2014 for National Narratives at Greifswald University, Greifswald (Germany) he has about sixty three national and international conference / seminar / keynote address, oral presentations and twelve selected book chapters and peer reviewed research articles in international journals. He makes documentary films and has produced for stage, AIR and DD. He is the founding chair of the International Association of Comparative Literature, Society and Culture (IACLSC). Ratnesh has been working with children for eighteen years. He propagates democratic, learner-driven environments. He is part of Aarohi​ Open Learning Community. Aarohi​ ​is a community of self directed learners -​ children who decide what they want to learn, how they want to learn, when they want to learn and use self assessment. At Aarohi, they do not follow any philosophy, but they follow the child​. Aarohi offer​s​ an open learning environment at ​ its campus in a village near Hosur. Mina is a Psychologist, Counselor, Trainer and Writer. With a Masters degree in Psychology from Madras University, and Diplomas in Child Psychology and Advanced Counselling Skills from Stonebridge Associated Colleges, UK, Mina Dilip has been training and counselling groups of people from various backgrounds for over five years now. Her sessions cover topics ranging from emotional and psychological issues to relationship management and personal growth. She is currently associated with MOP Vaishnav College for Women as a Consultant Trainer, where she addresses undergraduate and postgraduate students in large groups, dealing with life skills and emotional management. She also offers personal growth programs for teachers, and conducts parenting workshops periodically. With a special focus on non-directive play therapy, Mina works one-on-one with children as well as adults, offering counselling and therapeutic services using play-based methodologies. 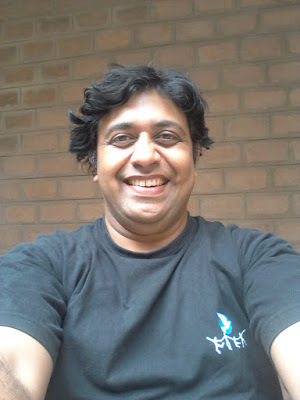 Rajesh is currently the India Representative of the International Playback Theatre Network (IPTN). He is a theatre trainer and coach who has trained thousands of participants over the last 22 years. He works with companies, educational institutions, NGOs and general public. Rajesh develops theatre based training modules to develop teams, build effective leadership, to de-stress, to develop better communication skills and to enhance personal creativity. He conducts Playback Theatre Workshops. This form of theatre uses audience real life stories as material for actors to play it back to audiences in real-time without any prior discussion. Rajesh is the founder of The Actors Collective. It is a theatre group with members who are primarily trained in Playback Theatre. The greater mission of The Actors Collective is to use theatre to foster peace, sensitivity and love among fellow human beings, also focusing on using multiple aids for personal growth and learning. Rajesh has also acted in commercial films. 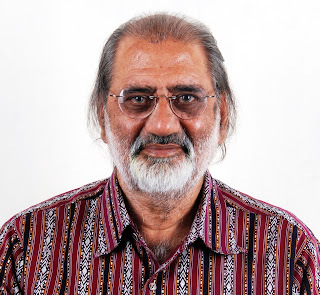 Design Educator Professor Sudarshan Khanna, was Principal Designer, Chairman of Education & Research and Head of Toy Innovation Centre at the National Institute of Design (NID), Ahmedabad, India. An internationally acclaimed designer and educator, he has helped establish several new courses and programs, including the Postgraduate Program in Toy & Game Design. Sudarshan Khanna is a pioneer in the research of interesting facets of indigenous toys and crafts communities all over India. He was conferred 1996 National Award for his life time work for design-science among children by Department of Science and Technology. He is recipient of international BRIO Award 2013 for his lifelong contribution for research and innovation for toy design and development in India. Prof. Sudarshan Khanna is the past president of ITRA (International Toy Research Association) and founder Chairperson of “Toys for Tomorrow”- vision-action international forum. Author of three books and many articles on toy design, culture and creative education, he featured in many educational TV programs. He has been conducting workshops in India and other countries – for teachers, trainers and students – relating value of design methods and creativity as part of innovative learning process. 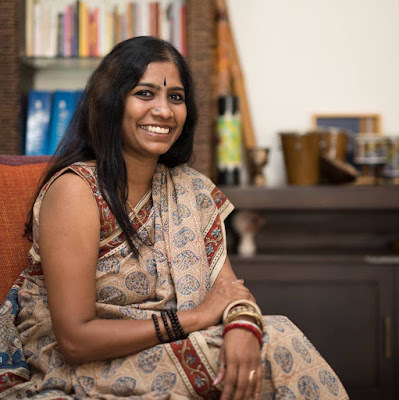 Gitanjali Sarangan, founder of Snehadhara Foundation is an educationist, a social entrepreneur, an Arts Based Therapy (ABT) Practitioner, Guide and ABT Educator with over a decade’s experience in teaching a diverse population of children and adults. Snehadhara Foundation is the first centre in the country that uses Arts Based Therapy as the only methodology to work with children and adults with special needs. She is also an Internship guide at the Indian Society for Training and Development. Gitanjali is a recipient of the Millennium Alliance Grant for the project ‘Kala Samavesh – Inclusion and Education of Disabilities. She has been awarded as one among the 50 Most Impactful Social Innovators (Global Listing) by the World CSR Congress and Awards. Gitanjali is also the recipient of the ‘Dr. Amarnath Annual Award for Inclusion’, 2016.She is one among two artists to be awarded the Artist’s Grant 2014 for the ‘Art in Education Program’ by the India Foundation for the Arts and the Artist’s Grant 2014 by India Foundation for the Arts. She has been recognised by Global Ethics Forum and Indian Institute of Management, for working towards establishing an impartial and fair world. She has also spoken at the TEDx BITS Hyderabad on ‘The Goodness of Life’. Gitanjali is on the panel of experts of the ‘Arivu Disha’ a two-Pronged Program to Improve Learning Outcomes and Career Prospects of government school children in Karnataka. Over the last few years, she has been conducting seminars and workshops with various groups and organisations on taking learning methodologies to varied populations using the Creative Arts. 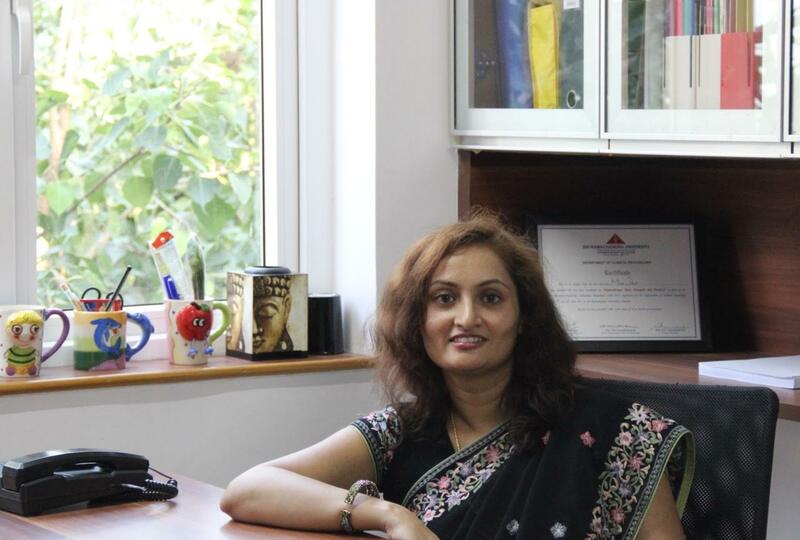 She has designed and facilitates a certificate course along with Headstreams at Christ University, IIPR (Indian Institute of Psychology and Research), St.Joseph’s and Mount Carmel College, Bangalore titled ‘Psycho-Socio well being using Arts and Play’. In association with Mirra Foundation she has designed and conceptualised Hridakasha– ‘Enabling peer to peer interaction to create inclusive empathetic learning spaces for children with disabilities using the Arts’ for the 9heads of organisations under the Abhividhi initiative in Chennai. Gitanjali conducts lectures for the students of the D.Ed and M.Ed courses at NIEPMD, Chennai and Amar Jyoti , Delhi. Born and educated in Mumbai, she has been a Lady Tata Memorial Scholarship Awardee and a University rank holder in Biochemistry. She has studied Applied Buddhist Psychology and Ethics from Pune University. Gitanjali is trained in Carnatic as well as Hindustani Classical music and is a Bharatnatyam dancer. 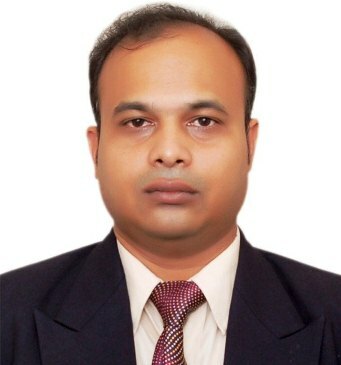 Naveen has over 17 years of experience in the social development sector. He currently leads Headstreams, an organisation that works on promoting human development through play. Naveen co-ordinates Post-Graduate Diploma and Certificate Courses in Play and Well-being. He also serves on the Board of Studies of Social Work Department in Christ University. Naveen has previously been involved in health research and policy issues on health as part of Community Health Cell, Bangalore and was part of the World Health Organisation (WHO) Watch team of the People’s Health Movement. Naveen is a trained social worker from Tata Institute of Social Sciences (TISS), Mumbai and has completed a specialised course in Medical Law and Ethics from National Law School of India University, Bengaluru. His doctoral thesis examines human vulnerability in the process of disaster recovery. Naveen’s intervention experience includes disaster response in the aftermath of the super-cyclone in Orissa, drought in Western Rajasthan, tsunami in Kanyakumari and floods in the northern part of Karnataka. 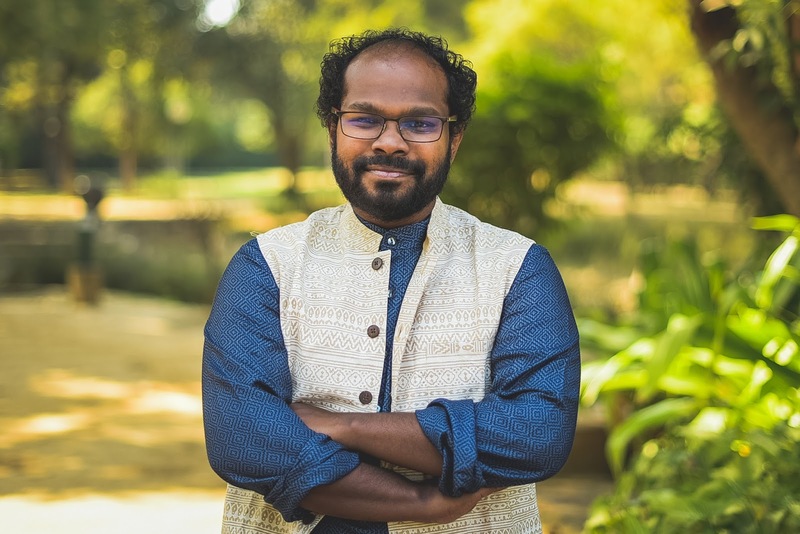 He has served as an independent consultant with Oxfam on a project titled health and disasters, and was the lead consultant for evaluating the permanent housing programme in tsunami-hit areas of Tamil Nadu and Kerala. Gitanjali Sarangan, founder & Executive Director of Snehadhara Foundation, is an educationist, a social entrepreneur, an Arts Based Therapy (ABT) Practitioner and an ABT Guide for Bangalore and South India with over a decade’s experience in teaching a diverse population of children and adults. Over the last few years, she has been conducting seminars and workshops with various groups and organisations on taking learning methodologies to varied populations using the Creative Arts. She has been recognised by Global Ethics Forum and Indian Institute of Management, for working towards establishing an impartial and fair world. She has also spoken at the TEDx BITS Hyderabad on ‘The Goodness of Life’. Gitanjali is on the panel of experts of the ‘Arivu Disha’ – a two-pronged Program to improve Learning Outcomes and Career Prospects of government school children in Karnataka. OBJECTIVE OF THE WORKSHOP: Arts and Gallatta – Learning can be fun and fun can be learning. BRIEF DESCRIPTION: The workshops aims to enable participants to look at mainstream content artistically, to comprehend the theory and practice of various forms of art and how these can be used in working with children and adults in inclusive settings, to experience and explore a realm of learning possibilities using the Arts, to help facilitators create a space for themselves and children to bring up questions, share feelings, reflect on thoughts, and discuss self-image, events in the world, relationships and biases in a non-threatening creative manner. The basic capacity for storytelling, painting, dance, singing, rhythm is inherent in all. Experiencing art forms be it music, dance, visual arts create synaesthesia between the nuances of art education, arts in education and therapy. The intent of this workshop is to explore art forms- voice and songs, play and dance to co-create safe learning spaces. ‘Harish Bhuvan is a trainer, facilitator and medical clown. He left his job at IIT Bombay to follow his passion of contributing towards the wellbeing of children. Since then he has been attached with esteemed hospitals and hospices of India working with terminally ill children and their caregivers. His unique mélange of clowning elements and counselling techniques to release the disease induced trauma in children has been admired in media and public alike. OBJECTIVE OF THE WORKSHOP: Laughter is the best medicine. BRIEF DESCRIPTION: This workshop would offer participants an opportunity to explore themselves, explore different relationships and to access their emotions and feelings in a supportive and nourishing environment. The participants get a chance to look at themselves from outside and gain insight. The workshop would also help participants be flexible in expression and action. Dr. Sonya Lorelle is a registered Play Therapist and National Certified Counselor. She teaches counselling at the Governors State University in Chicago’s Southland. As a member of The National Board of Certified Counselors International (NBCC-I), she travels overseas (including Bhutan and Thailand) to provide counselling interventions. Her areas of expertise include Play therapy, effects of trauma on children, child development, and qualitative methodology. BRIEF DESCRIPTION: Non-directive play therapy is a set of techniques used to help children communicate and understand their inner experiences through play and toys. The core belief of this method is that children have the internal drive towards wellness. While play therapists use non-directed play therapy to help children work through emotional and behavioral issues such as anxiety, depression, abuse/neglect, traumatic events, relationship problems, divorce and family problems; the procedures have been taught to parents and teachers as an effective way to build positive self-perception and self-understanding of the child. This special play time between parents and children can build a positive bond and create a powerfully nurturing environment for the child to flourish in. This workshop will cover the basic tenets and skills of non-directive play therapy as well as implications and applications. The National Association for Play Therapy India is a not for profit organisation that works to provide Play Therapy services and training throughout India, connecting therapists in the field and setting a nationwide standard for accredited therapists to adhere to, ensuring our clients receive the highest level of service. Erisha Speech & Language Interventions is a Trivandrum based centre that provides therapy to children who have issues with communicating like language impairment, autism, down syndrome, cerebral palsy, apraxia of speech, misarticulations and stuttering. Hi 5 Child Development Center is a unique center in Mumbai working with children with special needs and their families.The Center is child centric and is filled with child friendly environment in which they play and learn through effective therapies. OBJECTIVE OF THE WORKSHOP: This workshop on ‘The Therapeutic Benefits of Sensory Play’ aims to provide participants with a practical demonstration of the developmental and therapeutic benefits of sensory play. BRIEF DESCRIPTION: Participants will be engaged in stimulating multi-sensorial activities – including music, movement, visual and tactile experiences – demonstrating the holistic benefits of sensory play – learning and cognition, fine and gross motor, language and communication, social skills development, emotional regulation and well-being. Bharti Dekate is passionate about design and delivery of customized solutions with a deep regard to organizational context and realities. Bharti has handled various roles in Human Resources functions–in Sales HR, Plant HR and Organization Development, during her stint at Ranbaxy and Sanofi -Aventis. Some highlights of her work there include design and deployment of HR processes in the areas of performance management systems, due diligence and overseas operations, wage settlements, talent management practices, merger and integration activities. OBJECTIVE OF THE WORKSHOP: This workshop is meant for parents, teachers, professionals, students, sellers, buyers….anyone who uses conversational techniques to get work done. BRIEF DESCRIPTION: Stories! They’re everywhere. They’re inside us, outside us, around us, behind us. There’s a story for every occasion, a tale for every situation. There are stories with morals, stories without morals, stories about this and that, stories about you and me. We live storied lives and our stories weave into each other’s stories. We recognise our stories in someone else’s story. Dwell deeper into the art and science of storytelling to unearth deeper narratives. Tease out the unsaid and do more with what is said. The Story lab will introduce you to different tools and frameworks, to achieve a range of goals through stories. Sonali Nag is an Honorary Associate Director in The Promise Foundation and Associate Professor For Education And The Developing Child, University of Oxford. The Promise Foundation is a charitable trust established in 1987 to apply the behavioural sciences to promote the educational, social and economic development of the individual. OBJECTIVE OF THE WORKSHOP: To demonstrate how play can be interwoven into literacy and language development activities for pre- and primary schoolers. BRIEF DESCRIPTION: This workshop will share ideas from The Promise Foundation’s Programmes for Assisted Learning (PAL). PAL sessions comprise periods of talk, hands-on activities, working with text and child publishing. In 2016 we developed a vacation module for village children that use traditional games as the theme to support and supplement literacy and language development. This workshop will share ideas from this module bringing focus on the intrinsic value of play ideas and team games as themes to encourage practice of decoding and meaning-making strategies. The workshop will end with participants being invited to pen a text on a traditional game they played in their childhood. aProCh, a community based initiative was born out of this need for change. Started by students of the Riverside School, Ahmedabad, it was envisioned to create “a Child friendly city”, which accords safety to the child; where the child has freedom to explore, derive fun and joy, has ample opportunity and builds happy memories for a lifetime. OBJECTIVE OF THE WORKSHOP: This will enable educators to inculcate 21st century skills, develop motor skills and self-expression to children. It will be an opportunity to be engaged with play and its ability to help construct, implement and evaluate play approach to teaching. BRIEF DESCRIPTION: Participants will work collaboratively to create a portrait or an installation using open- ended materials which will help them develop relationships and share their insights on play pedagogy. Surabhi Khanna is a designer, educator. She has a Masters in industrial design from NID, India (toy & game design), after graduation in architecture. Since 2012, she has been working on projects and workshops related to heritage, innovations, culture-based design. She has been associated with several institutions of design and education as a part time/ visiting faculty. An exchange designer in Germany, invited participant for UNESCO creativity workshop on Inclusive education and development, she was co-invitee to Colombia, South America for talks-workshops on design & education and for talk-workshops by Aalborg university, Denmark. She is currently associated as assistant professor of product design at Sushant School of Design, Ansal university. Design Educator Professor Sudarshan Khanna , was Principal Designer, Chairman of Education & Research and Head of Toy Innovation Centre at the National Institute of Design (NID), Ahmedabad, India. An internationally acclaimed designer and educator, he has helped establish several new courses and programs, including the Post Graduate Program in Toy & Game Design. He was conferred 1996 National Award for his life time work for design-science among children by Department of Science and Technology. He is recipient of international BRIO Award 2013 for his lifelong contribution for research and innovation for toy design and development in India. Prof. Sudarshan Khanna is the past president of ITRA (International Toy Research Association) and founder Chairperson of “Toys for Tomorrow”- vision-action international forum. Author of three books and many articles on toy design, culture and creative education, he featured in many educational TV programs. He has been conducting workshops in India and other countries, for teachers, trainers & students, relating value of design methods and creativity as part of innovative learning process. BRIEF DESCRIPTION: The workshop will start with an introduction of how design and indigenous toys can provide a rich resource for interactive education at all levels. How do we enrich participatory learning by use of 3H: Hands, Heart & Head! How do we create more from less using indigenous knowledge and local materials and techniques? How do we develop skills, creativity and sense of empowerment for learners? The workshop will consist of a series of mini projects of making and developing indigenous play ideas for learning. Play for Peace movement started around 1996 in Chicago, USA. The Mission of Play for Peace is to bring together children, youth, and organisations from communities in conflict, using cooperative play to create laughter, compassion, and peace. Play for Peace is not a project per se, but it is a process that can be integrated with other projects/movements/initiatives that share common values. It is a process, when done with consistency, transforms the way people look at each other and build deeper connections based on empathy and respect. We use the medium of play that is centered on core values of inclusion, cooperation, emotional and physical safety, role modeling and fun. In addition, we supplement play with processes that are experiential in nature. OBJECTIVE OF THE WORKSHOP: To provide a safe space to experience the joy of Play. Share the journey of Play for Peace in India. Build a perspective around and connection between, Play & Child rights. Community building and Youth development through Play. BRIEF DESCRIPTION: This process will be 60 minutes experiential process, where we will play cooperative games followed by experience sharing. Audio visual presentation; sharing experiences of Play for Peace in India. Aarohi​ ​is a community of self directed learners -​ children who decide what they want to learn, how they want to learn, when they want to learn and use self assessment. They do not follow any philosophy, they follow the child​. Aarohi offer​s​ an open learning environment at ​ its campus in a village near Hosur. BRIEF DESCRIPTION: Participants will play a number of games covering a cross section of subjects / concepts / skills​. The workshop will also cover a wide range of mediums and types of games. Overall, we plan to have a lot of fun PLAYING and letting learning happen through it. Mina is a Psychologist, Counselor, Trainer and Writer. With a Masters degree in Psychology from Madras University, and Diplomas in Child Psychology and Advanced Counselling Skills from Stonebridge Associated Colleges, UK. Mina Dilip has been training and counselling groups of people from various backgrounds for over five years now. Her sessions cover topics ranging from emotional and psychological issues to relationship management and personal growth. She is currently associated with MOP Vaishnav College for Women as a Consultant Trainer, where she addresses undergraduate and postgraduate students in large groups, dealing with life skills and emotional management. She also offers personal growth programs for teachers, and conducts parenting workshops periodically. OBJECTIVE OF THE WORKSHOP: Play as a creative medium in developing self-awareness. BRIEF DESCRIPTION: The workshop engages all five senses and develops a keener sense of self and body connectedness. The workshop will introduce the concepts of feeling management / emotional intelligence, and developing it through play. Life and Dance is a dance therapy organisation created by Dr. Nikita Mittal that revolves around giving people an opportunity to experience freedom in dance and freedom through Dance. Life and Dance emphasizes on the body as a vehicle, for self-development and healing, and the mind as a catalyst. OBJECTIVE OF THE WORKSHOP: This workshop on ‘A perspective of Play through Dance and Movement’ will help the participants understand the movement science and connect it to the play pedagogy. BRIEF DESCRIPTION: This workshop is crafted for the play practitioners. Play and movement are closely connected as none can exist without the other.Play involves movements and every movement is a play. Neuroscience researchers indicate that Play and movement coexist and boost up not only our physical development but majorly enhances the cognitive abilities also. All aerobic and intentional exercises boost up the BDNF ( Brain Derived Neurotrophic Factor) which is essential for growth of the brain cells. This workshop helps you to connect the movement dots in the play, making your practice rich. Rajesh is the founder of The Actors Collective. Rajesh develops theatre based training modules to develop teams, build effective leadership, to de-stress, to develop better communication skills and to enhance personal creativity. He conducts Playback Theatre Workshops. OBJECTIVE OF THE WORKSHOP: This workshop will focus on introducing participants to theatre. BRIEF DESCRIPTION: The workshop will be filled with very specialized games that help open up participants so that they have lots of fun and learn about themselves in the bargain.